Biochar is the carbon-rich product obtained from the thermochemical conversion of biomass under oxygen-limited conditions. Biochar has attained extensive attention due to its agronomical and environmental benefits in agro-ecosystems. This work adopts the scientometric analysis method to assess the development trends of biochar research based on the literature data retrieved from the Web of Science over the period of 1998–2018. By analysing the basic characteristics of 6934 publications, we found that the number of publications grew rapidly since 2010. Based on a keyword analysis, it is concluded that scholars have had a fundamental recognition of biochar and preliminarily found that biochar application had agronomic and environmental benefits during the period of 1998–2010. 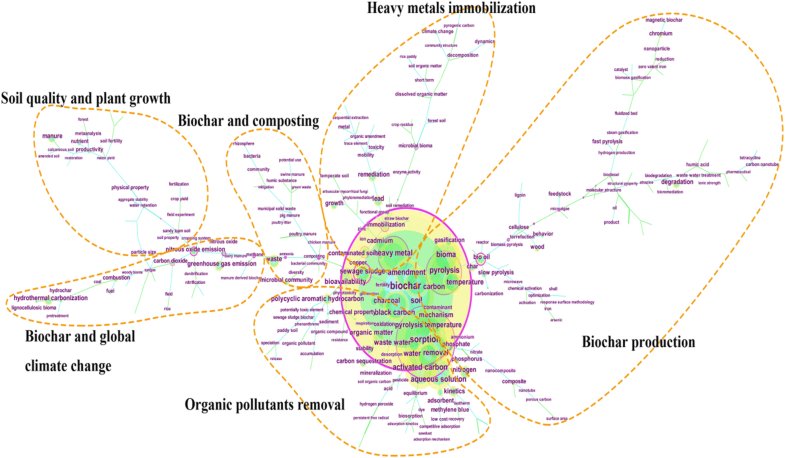 The clustering results of keywords in documents published during 2011–2015 showed that the main research hotspots were “biochar production”, “biochar and global climate change”, “soil quality and plant growth”, “organic pollutants removal”, and “heavy metals immobilization”. While in 2016–2018, beside these five main research hotspots, “biochar and composting” topic had also received greater attention, indicating that biochar utilization in organic solid waste composting is the current research hotspot. Moreover, updated reactors (e.g., microwave reactor, fixed-bed reactor, screw-feeding reactor, bubbling fluidized bed reactor, etc.) or technologies (e.g., solar pyrolysis, Thermo-Catalytic Reforming process, liquefaction technology, etc.) applied for efficient energy production and modified biochar for environmental remediation have been extensively studied recently. The findings may help the new researchers to seize the research frontier in the biochar field. The online version of this article ( https://doi.org/10.1007/s42773-019-00002-9) contains supplementary material, which is available to authorized users. Biochar is a widely used scientific term that attains great attention worldwide (Lehmann and Joseph 2015). There are several definitions for biochar. According to the International Biochar Initiative (IBI), the most accepted and standardized definition is “a solid material obtained from the thermochemical conversion of biomass in an oxygen-limited environment” (IBI 2012). Biochar, due to its specific properties, has sparked increasing recognition with wide applications in agriculture and environment (Ahmad et al. 2014; Atkinson et al. 2010; Woolf et al. 2010). In 2007, Lehmann (2007) reported that biochar could lock carbon up in soils with potential to mitigate climate change. In the same year, Chan et al. (2007) found that biochar amendment could improve fertilizer Nitrogen use efficiency and soil quality. Subsequently, researchers began to establish that pyrolysis was an energetically efficient strategy for bioenergy production in 2008 (Gaunt and Lehmann 2008). Then, biochar was also found to remediate organic compounds and heavy-metal pollution (Cao et al. 2009; Chen et al. 2008) and mitigate soil greenhouse gases emissions (Singh et al. 2010). More benefits were discerned for biochar application over time. The research about biochar production and application depends on agricultural and social development and demand. The massive production of agro-forestry residuals in the world offers an abundant source for biochar preparation and a solution to agro-forestry waste utilization (Gwenzi et al. 2015; Meng and Chen 2013; Shi 2011). Researchers found that, in addition to sequestering carbon (Lehmann et al. 2008) and reducing greenhouse gas emissions (Singh et al. 2010; Woolf et al. 2010), biochar application can improve soil fertility, soil water-holding capacity and crop yields (Van Zwieten et al. 2010; Warnock et al. 2007). With high levels of human and industrial activities, increasing amounts of organic contaminants such as pesticides, pharmaceuticals, personal care products, hormones, plasticizers and food additives had been discharged into the environment, posing threats to ecosystem and human health (Jean et al. 2012; Sorensen et al. 2015; Teixido et al. 2011). Biochar served as an effective strategy for the removal of organic contaminants as well as for decreasing their bioavailability (Teixido et al. 2011). However, the removal of organic pollutants by biochar largely depends on feedstock, heat treatment conditions (i.e., residence time, temperature, heating rate, and reactor type), and type of organic contaminants (Lian et al. 2011, 2016; Qin et al. 2017a; Sun et al. 2011; Xie et al. 2014; Zheng et al. 2017). It is significant to choose the right precursors and preparation conditions to obtain biochars with high removal efficiency for a specific organic pollutant. Apart from organic contaminants, the issue of heavy metals/metalloids due to anthropological activities is also becoming a serious food safety issue (Hou et al. 2018; Li et al. 2014c; Liu et al. 2010; Wang et al. 2010; Yin et al. 2016). The research about biochar remediation for heavy metals/metalloids contamination is well documented (Beesley and Marmiroli 2011; Cao et al. 2009; Chen et al. 2016; Lu et al. 2012b; Qian et al. 2017; Trakal et al. 2014). With deeper understanding, the structures and surface properties of biochar have been modified with diverse methods, which deserves an increased attention globally (Chen et al. 2011; Creamer et al. 2018; Deng et al. 2017, 2018a; Ling et al. 2017; Son et al. 2018; Yao et al. 2013; Zhang et al. 2013a). Although a large number of published reports have reported agronomic and environmental benefits from the application of biochar, its specific properties would be changed after long-term application into the soil (Mukherjee et al. 2014; Sorrenti et al. 2016; Yang et al. 2016a; Zimmerman et al. 2011). More importantly, potential risks of biochar to the ecosystem are important concerns before its large-scale application in agriculture and for environmental remediation (Domene et al. 2015; Lian and Xing 2017; Liao et al. 2014; Mierzwa-Hersztek et al. 2017; Oleszczuk et al. 2013). Biochar has heterogeneous nature and structures, which extremely affect its corresponding role, function, and application for agronomic and environmental benefits. Therefore, it is important to summarize the development of biochar production or application and predict its environmental behavior in the future. Despite the growing concern and publications about biochar, little research has addressed analyzing the development trends of biochar domain. Moreover, research about biochar is complicated and overlapped with other subjects, the linkage among the research hotspots has not been mapped out previously. To bridge these gaps in relevant publications on biochar, a visual scientometrics analysis was conducted by CiteSpace, which was an excellent scientometric tool. So far, it has been extensively utilized to detect research trend and fronts, development of the whole subject field and to facilitate interaction between different fields and so on (He et al. 2018a; Yu and Xu 2017). The purpose of this study is to comprehensively and systematically provide a scientometrics review of research topics and evolutionary trend of biochar over time. The paper data were retrieved from the Web of Science (WoS) Core Collection. WoS Core Collection database was adopted for this study’s journal search and retrieval. It is because WoS is regarded as the most comprehensive and it also contains the most relevant and influential journals in its record combined with WoS’s scientific robustness (Olawumi and Chan 2018). The search topic was “biochar”. The data were considered valid if any of biochar appears in the following three fields including abstract, keywords, and the title of a downloaded record. According to our retrieved document set, we found that the first publication about biochar was published in 1998. Therefore, this study systematically reviews a large number of studies between 1998 and 2018 to investigate the research trends of biochar during the past two decades. CiteSpace is a Java-based bibliometric tool developed by Chen et al. (2014). CiteSpace provides multiple functions, including finding research fronts and hotspots, promoting knowledge dissemination and interaction between different fields and exploring the emerging trends (Chen et al. 2014). 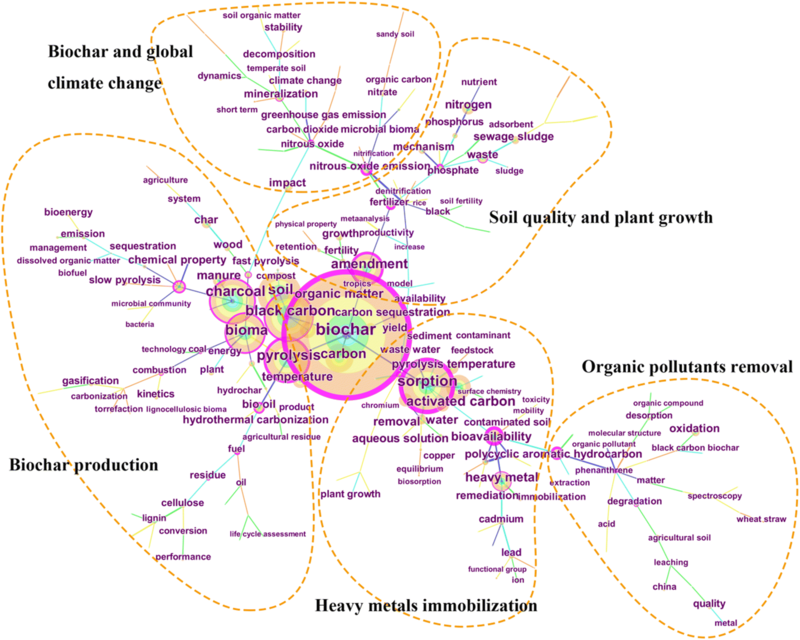 In CiteSpace, hot research topics and frontline research about biochar are mapped and identified based on the frequency of popular keywords used in existing literature. In viewing the maps, a node represents one item such as a keyword. A total of 6934 documents were obtained in the field of biochar on September 16, 2018. The numbers of publications for each year and cumulative numbers of publications are depicted in Fig. 1. The number of publications grew dramatically since 2010 (Fig. 1). This fully explained why the research on biochar is becoming an increasing concern. The publications were mainly categorized into nine document types (article, proceeding paper, review, meeting abstract, editorial material, correction, letter, book chapter, and news item), and articles were the dominant document publication type followed by proceeding paper, review, and other types of publications (Fig. S1). Table S1 presents a broader summary of the top 10 subject categories in biochar area. With 2495 publications, “Environmental Sciences and Ecology” was the most popular subject category followed by “Environmental Sciences”, “Agriculture”, “Engineering”, “Energy & Fuels”, “Soil Science”, “Chemistry”, “Engineering, Environmental”, “Engineering, Chemical”, and “Biotechnology and Applied Microbiology”. “Energy & Fuels” had the highest centrality and played a critical role in biochar research among 10 subject categories followed by “Engineering” and “Engineering, Chemical”. Overall, biochar is a multifaceted and multidisciplinary field that receives various attention. Table S2 shows the top 15 most productive countries in biochar area. From Table S2, we found that China published the most number of publications in this area, indicating that China played a significant role in biochar research. That might be attributed to the fact that China is a large agricultural country, where agriculture has an important and strategic position (Xing and Zhu 2000). China was followed by USA, Australia, Germany, South Korea, Spain, Canada, England, India, and Italy. India was second from developing countries among the ten countries, and agriculture is the foundation of the national economy of India. Based on the results of this analysis, there are 431 authors that have devoted publications to biochar research in the past 20 years. The top 15 productive authors are listed in Table S3. Among them, five come from China, four from the USA, two from Australia, one from South Korea, one from Norway, one from Poland and one from Republic of Korea, respectively. The results suggested that the achievements of Chinese and American authors in this field are the highest in the world, which reflected China’s emphasis on this field. Yong Sik Ok contributed the highest record count with 154 articles published so far, followed by Bin Gao with 85, and Johannes Lehmann with 75, and Johannes Lehmann et al. (2011) contributed the highest rate of citations. Keywords are descriptive words and a keyword analysis can be utilized to monitor the development of the research field over time (Yu et al. 2017). 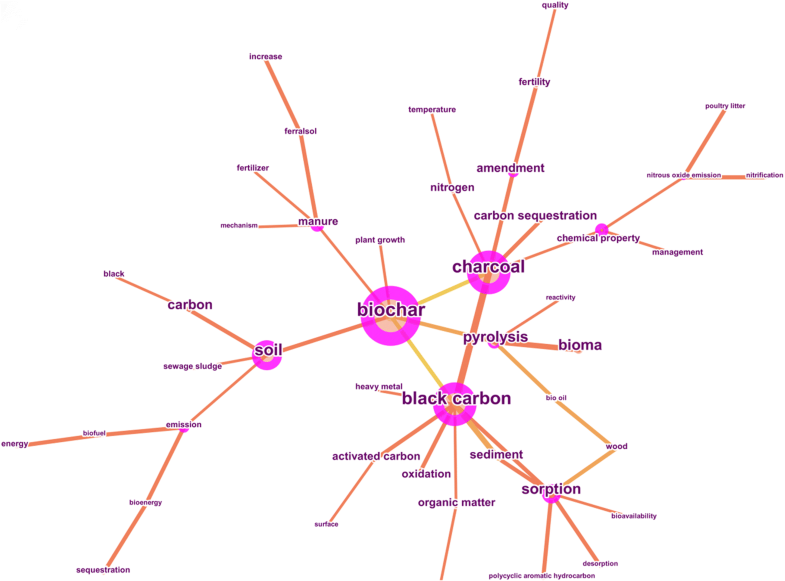 The keywords related to biochar were conducted by CiteSpace. During the process, keywords with the same meaning were combined, such as “contamination” and “pollution”, “Pb” and “lead”, “Cu” and “copper” and so on. We conducted three networks for the co-word analysis from 1998 to 2010, 2011–2015, 2016–2018, respectively. As shown in Figs. 3, 4, and 5, the number of keywords and research nodes increased rapidly, and the cross fusion of each cluster was significantly enhanced across the timeline. The results suggested that the research about biochar was constantly developed and became diversified. 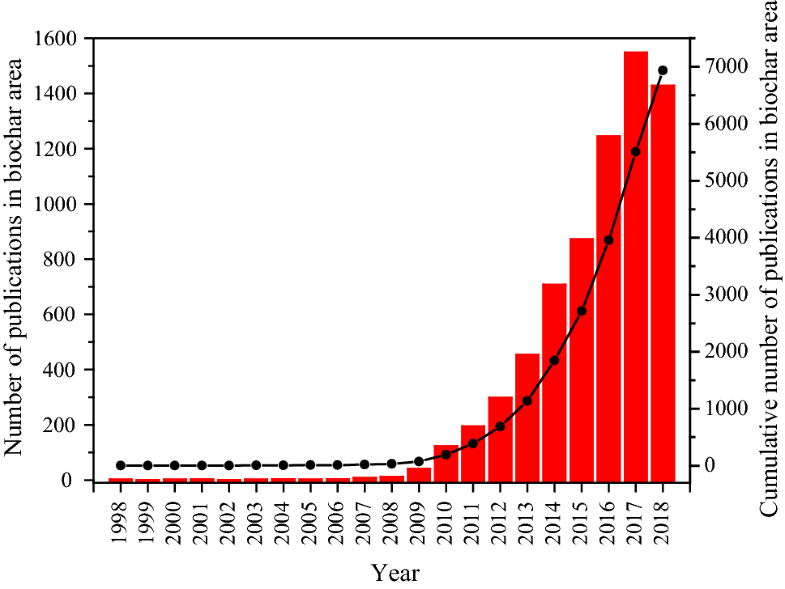 We summarized the research topics and trends of biochar over the period of 1998–2018 (Fig. 2). The following is a common analysis of the three Figs. 3, 4, 5 and Table 1. The discussed keywords in the study generally had high frequency and betweenness centrality. There were 194 articles published about biochar during 1998–2010. Figure 3 describes the simple network of the main keywords. Some nodes have purple rings around their outer edge indicating the high betweenness centrality of this field. The nodes “Biochar”, “Black carbon” and “Charcoal” were the main research contents in this period. “Biochar” is the abbreviation of “biocharcoal” and uniformly named as “biochar” at the first International Biochar Conference in 2007 in Australia. “Biochar” and “Charcoal” belong to “Black carbon” (Zimmerman 2010), indicating that the researchers just have a fundamental recognition of biochar before 2010. The keyword “soil” followed by “biochar”, “black carbon” and “charcoal”, which suggested that people began to pay attention to soil environment after adding biochar into soil. Zimmerman (2010) showed that biochar was difficult to be oxidized through abiotic processes and displayed long-linearly decreasing mineralization rates. Therefore, converting biomass into biochar and its application into soil were seen as a means for long-term carbon sequestration (Lehmann et al. 2008; Zimmerman 2010). Studies showed that soil biochar amendment had a substantial contribution to mitigating climate change by reducing carbon dioxide, methane, and nitrous oxide emissions (Singh et al. 2010; Woolf et al. 2010). In addition, plant growth trials estimated that application of papermill biochars into ferrosol soil could improve soil quality and plant productivity (wheat, soybean, radish), and reduce Al bioavailability (Van Zwieten et al. 2010). The keyword “sorption” also showed high frequency. In this period, soil pollution was serious, therefore, scholars began conducting research related to soil remediation with biochar. Chen et al. (2008) viewed the sorption of hydrophobic organic compounds (HOCs) as a transition from a partition with noncarbonized organic matter of biochar dominant to an adsorption dominant process with increasing pyrolysis temperatures. The results may provide a new viewpoint for sorption of organic contaminants. The addition of mixed sawdust biochar (5% w/w) to soil was also found to increase the sorption of atrazine and acetochlor presumably as a result of the increase in organic carbon in the soil (Spokas et al. 2009). The dairy-manure-derived biochar was rich in CO32− and PO43− minerals, which were effective for the removal of Pb by formation of Pb9(PO4)6 and/or Pb3(CO3)2(OH)2 precipitates (Cao and Harris 2010; Cao et al. 2009). Their results also showed that biochar was also effective in sorbing atrazine where atrazine was partitioned into its organic phase (Cao and Harris 2010; Cao et al. 2009). The rise in soil pH by the addition of broiler litter biochar was also another factor for an enhanced immobilization of Pb (Uchimiya et al. 2010). In general, scholars had a basic understanding of biochar and the preliminary findings showed that biochar could sequestrate carbon, mitigate climate change, improve soil quality, increase crop yield, and remediate heavy metals and/or organic compounds pollution during the period of 1998–2010. However, the studies published over 1998–2010 were only focused on limited types of biochars, soils, pollutants, and the underlying mechanisms were lacking. Documents about biochar are substantially expanded and increased since 2010 with 2521 documents published during the period of 2011–2015. Comparing with the period (1998–2010), the research about biochar was considerably diversified and developed with an obvious increase in keywords, nodes, and interlaced lines during the period of 2011–2015. According to visual and statistical analysis, biochar research over 2010–2015 was primarily divided into the following five fields: biochar production, biochar and global climate change, soil quality and plant growth, organic pollutants’ removal, and heavy metals’ immobilization. The biochar studies published during 2011–2015 covered the details of its production and characterization as compared to studies on biochar production during 1998–2010. Major thermochemical technologies for biochar production included slow and fast pyrolysis, gasification, torrefaction, and hydrothermal carbonization (Kambo and Dutta 2015; Sharma et al. 2015). The condition of slow pyrolysis was similar to the naturally occurring burning process and more conducive to the high yield of biochar (Liu et al. 2015). It was generally acknowledged that the thermal conversion of biomass and resulting biochar characteristics were mainly regulated by the nature of feedstock and heat treatment temperature (HTT) (Cantrell et al. 2012; Kloss et al. 2012; Park et al. 2014; Peng et al. 2011; Wang et al. 2013; Yuan et al. 2011). The alkalinity, pH, ash content, N2-BET surface area, and aromaticity could be elevated with increasing HTT, while the yield, cation exchange capacity (CEC), surface functional groups, and aliphaticity/polarity decreased with increasing HTT (Wang et al. 2013; Wiedemeier et al. 2015; Yuan et al. 2011). On the other hand, the nature of feedstock could also play a significant role in the pyrolysis process of biomass components and the resulting biochar properties. Crop residue-derived biochars presented higher yield and carbon content than wood-based biochars from bamboo and elm (Enders et al. 2012; Wang et al. 2013). Biochars produced from biomass with higher content of lignin had generally higher yields and carbon content due to the relatively low thermal decomposition of lignin (Qu et al. 2011; Wang et al. 2013). Animal litter and solid waste generally produced a high biochar yield compared to that of crop residues and wood biomass, due to the relatively high ash content of animal litter- and solid waste-derived biochars (Enders et al. 2012). Another potential use of converting waste biomass into biochar was the production of biofuel (e.g., biogas or bio-methanol) (Imam and Capareda 2012; Liu et al. 2013; Shabangu et al. 2014) and bioenergy storage materials (e.g., supercapacitors, lithium-ion batteries, and fuel cells) (Kalyani and Anitha 2013; Yu et al. 2014) by thermal treatment. Biofuel or bioenergy production was dependent on the thermal treatment conditions (HTT, heating rate, and reaction time) and feedstocks (Imam and Capareda 2012; Ortega et al. 2011). There were a number of studies focusing on the toxicity of biochar to organisms. Carbonization process of biomass could form contaminants, mainly including polycyclic aromatic hydrocarbons (PAHs) and heavy metals. The concentration and composition of these contaminants were highly dependent on feedstock and the thermal treatment process. The greatest concentrations of solvent-extractable PAHs were generally found in biochar produced at intermediate HTT (350–550 °C), and then the concentrations of PAHs decreased at relative high HTT (> 600 °C) (Hale et al. 2012; Keiluweit et al. 2012). Additionally, PAHs’ concentrations were generally decreased with increasing duration time (Hale et al. 2012). Total PAHs concentrations in fast pyrolysis and gasification biochars were higher than that in slow-pyrolysis biochars (Hale et al. 2012). Beside the total PAHs concentrations, the bioavailability of PAHs in biochars was also investigated. Hale et al. (2012) used partitioning coefficients to calculate the bioavailability of PAHs in biochars and their results showed that the bioavailable concentration of PAHs in biochars could be considered background or trace. Low risk associated with the concentrations of PAHs was also observed in biochar (Freddo et al. 2012). With respect to heavy metals, they were mainly originated from heavy metal-containing feedstocks such as sewage sludge and livestock manure (Hossain et al. 2011; Lu et al. 2012a). The conversion of sewage sludge or livestock manure to biochar significantly increased the contents of heavy metals (Pb, Cd, Zn, Cu, Ni, Mo, and Cr), which would exceed some quality standards (Cely et al. 2015; Devi and Saroha 2014; Hossain et al. 2011; Lu et al. 2012a). Despite high heavy-metal content in the biochars, the bioavailability of heavy metals was low because most of the heavy metals existed in reducible, oxidizable and residual fractions (Devi and Saroha 2014). Moreover, the bioavailability and ecotoxicity of heavy metals in biomass were significantly reduced after conversion into biochar as the mobile and bioavailable heavy metals were transformed into the relatively stable fractions (Cely et al. 2015; Devi and Saroha 2014). However, significant inhibition of seeds germination was observed in water suspensions with poultry litter biochars, which was tentatively attributed to hydrophilic biodegradable substances (Rombola et al. 2015). The study provided a new idea for the investigation of phytotoxicity of biochars. Additionally, Liao et al. (2014) found surface-free radicals in biochars during the pyrolysis of biomass and they comprehensively reported the abundant and quite persistent free radicals (PFRs) within biochars derived from corn stalks, rice and wheat straws as observed by electron paramagnetic resonance (EPR). Their results also showed that the PFRs within biochars had negative effects on plant growth (Liao et al. 2014). 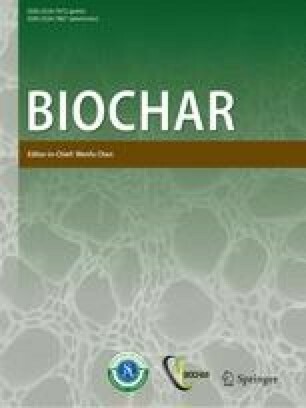 The study reported the phytotoxicity of biochars from the respective of free radicals within biochars, which brings attention to the possible environmental risk related to biochar applications from a new scale. Studies published during 1998–2010 had highlighted the advantages of using biochar in terms of soil carbon sequestration and greenhouse gas emissions with the potential for mitigating global climate change. Considerable growth in this research field was further found during 2011–2015, which suggested the continuously increasing interest in this field. Moreover, research in this field was more extensive and comprehensive. Previous studies (1998–2010) on biochar and global climate change used the method of prediction models or were limited to one or two soil types, which enormously lacked authenticity and generalization. During 2011–2015, increasing studies focused on biochar application into different agricultural soils for investigating the carbon and nitrogen cycle. The use of different biochar types in various soils could find out regularities and maximize the effects of biochar for global climate change mitigating. The increasing application time could be more appropriate for exploring the carbon and nitrogen cycles in soils amended with biochar. Studies over 1998–2010 revealed that converting waste biomass into biochar was an effective means to sequestrate carbon (Gaunt and Lehmann 2008; Roberts et al. 2010; Woolf et al. 2010). Moreover, biochar was slow to degradate and exhibited long-term stability in soils compared with raw biomass (Masiello and Druffel 2003; Nguyen et al. 2008; Zimmerman 2010). Comprehensive and detailed information on biochar stability had been provided during 2011–2015. In general, higher HTT, longer reaction residence time, and biomass of higher-lignin content with larger particle size produced biochar with higher stability (Fang et al. 2014b; Harvey et al. 2012; Manya et al. 2014; Singh et al. 2012; Windeatt et al. 2014). Li et al. (2014a) demonstrated that mineral (kaolin, calcite, calcium dihydrogen phosphate) addition strengthened biochar stabilization, delivering a new idea to produce the designed biochar with high carbon sequestration capacity and stability. Moreover, Karhu et al. (2011) showed that biochar addition could increase CH4 uptake. Anderson et al. (2011) reported that the organisms involved in nitrification were less abundant while denitrification increased along with N2 fixation after biochar amendment. Their results also showed that biochar could effectively adsorb NH4+, thus reducing N2O emissions (Anderson et al. 2011). These results systemically explained the mechanisms of reduction in climate-relevant N2O emissions from the perspective of microbial community change. Cornelissen et al. (2013) demonstrated N2O sorption to anhydrous biochars as a plausible mechanism of N2O emission reduction. Van Zwieten et al. (2014) demonstrated by 15N stable isotope techniques that biochar amendment lowered emissions of N2O in the Tenosol by providing conditions suitable for nitrous oxide reductase (nosZ). In general, the emission of greenhouse gases (CO2, CH4, N2O) in soils amended with biochar was through abiotically and biotically mediated mechanisms, and corrected with soils and biochar properties. The research on soil quality and plant growth with biochar amendment during the period of 2011–2015 was also focused on field experiments, but not just pot experiments. Moreover, the effects of different agricultural soils, biochars, and biochar application rates were more comprehensively considered compared with the period of 1998–2010. Biochar amendment had been shown to increase soil pH, soil organic carbon, water-holding capacity, and cation exchange capacity (CEC) (Abiven et al. 2015; Zhang et al. 2012). Biochar could also improve soil fertility as it facilitates the biochemical cycling of nitrogen and phosphorous (Nelissen et al. 2012; Spokas et al. 2012; Yao et al. 2012; Zheng et al. 2013). Moreover, the organic matter and inorganic ions (e.g., N, P, K, Ca, Mg, Si) of the biochar provided nutrients to the plants (Hossain et al. 2011; Mukherjee and Zimmerman 2013; Rajkovich et al. 2012; Xiao et al. 2014). Research began to take advantage of engineered biochars with a high sorption capacity of phosphate and to recycle phosphate as an effective slow-release P-fertilizer in soils (Yao et al. 2013). The findings provided a new sustainable and eco-friendly strategy to design biochar for specific nutrient release. The improved fertility and nutrients supply subsequently facilitated plant growth for short- and long-term biochar amendment in soil (Jones et al. 2012; Khan et al. 2013; Rajkovich et al. 2012; Zhang et al. 2012). The plant growth increment largely depended on soil types, plant species and biochar properties (Jones et al. 2012; Rajkovich et al. 2012; Solaiman et al. 2012). However, negative impact of biochar application on plant growth has also been reported. A pot experiment showed that food waste biochar and its high application rates (7%) reduced maize growth in a loamy soil (Alfisol) (Rajkovich et al. 2012). Similarly, wheat growth was inhibited in an oak biochar-amended Typic soil (4.5% application rate) (Aguilar-Chavez et al. 2012). The negative effects might be attributed to reduced nutrient bioavailability, high salt concentrations or the release of phytotoxic chemicals from biochar at high application rates (Aguilar-Chavez et al. 2012; Rajkovich et al. 2012). Based on the results of Chen et al. (2008), increasing studies were focused on the sorption of multiple organic contaminants on biochars to comprehensively explore the underlying mechanisms. Besides the mechanisms of partitioning and adsorption for HOCs removal by biochar put forward by Chen et al. (2008), more details on the removal mechanisms were demonstrated by later studies. The mechanisms of adsorption could be divided into π–π electron donor–acceptor interaction, H-bond, pore-filling, and hydrophobic effect (Ahmad et al. 2012a; Chen et al. 2012; Lian et al. 2011; Zhang et al. 2013b). During the sorption process, contribution of partitioning and H-bond gradually decreased; whereas, the effects of π-bond, pore-filling and hydrophobicity increased with increase of HTT (Chen et al. 2012; Li et al. 2014b; Lian et al. 2011). Sun et al. (2011) reported that biochar produced at 400 °C exhibited the highest sorption capacity for norflurazon and fluridone among biochars produced via pyrolysis at 200–600 °C. However, the sorption of trichloroethylene on biochar produced at 700 °C was higher than at 300 °C (Ahmad et al. 2012b). Lian et al. (2011) also reported that the sorption of 1,3-dinitrobenzene (DNB) and 2,4-dichlorophenol (DCP) on biochars increased with increasing pyrolytic temperatures, whereas, the sorption of 1,3-dichlorobenzene (DCB) linearly decreased with pyrolytic temperatures increasing. The discrepancy was attributed to the nature of HOCs. Polar compounds, such as DNB and DCP, were sorbed mainly by adsorption process (π-bond, pore-filling), whereas, apolar compounds, such as trichloroethylene and DCB, were mainly sorbed by partitioning (Lian et al. 2011). The sorption of ionizable organic compounds (IOCs) on biochar had been widely reported (Lian et al. 2014; Teixido et al. 2011; Xie et al. 2014) due to their heavy use and potential adverse effects on aquatic organisms (Ankley et al. 2007). The sorption mechanisms of IOCs were attributed to electrostatic attraction, surface precipitation (Xu et al. 2011), negative charge-assisted H-bonding (Lian et al. 2014; Teixido et al. 2011), and π–π electron donor–acceptor interaction (Teixido et al. 2011). The sorption of IOCs was largely dependent on pH. When the solution pH < pHzpc of biochar, the sorption capacity of IOCs on biochar increased or slightly changed with increasing pH due to its dependency on the different contributions of electrostatic repulsion and adsorption contributors (H-bond, π-bond) (Teixido et al. 2011; Xie et al. 2014). The sorption capacity of IOCs decreased significantly when the aqueous pH > pHzpc of biochar, which might be attributed to the electrostatic repulsion between the anions of adsorbate molecules and the negatively charged biochars (Teixido et al. 2011; Xie et al. 2014). However, the sorption of methyl violet increased with increasing pH due to the precipitation and increased electrostatic attraction. Therefore, the properties of IOCs played an indispensable role in the sorption of IOCs on biochar. Another method for removal of organic contaminants was degradation, which could completely remove organic contaminants from the environment as compared with sorption. Oh et al. (2013) stated that wastewater solids or poultry litter-derived biochars with high contents of redox-active metals, such as Fe, Cu, and Mn could promote the degradation of nitro herbicides. The studies from Fang et al. (2014a, 2014b, 2015a, 2015b) showed that PFRs in biochar exhibited an excellent ability to activate persulfate/hydrogen peroxide/oxygen for the degradation of organic contaminants. These studies provided a new insight into the degradation of organic contaminants from the perspective of free radicals. The research about biochar as a sorbent for heavy metals or metalloids immobilization had also received extensive attention. From Table 1, we found that the keyword “sorption” had the second highest frequency and high centrality of 0.84, which confirmed that it became an area of popular concern. Several previously published articles had investigated the sorption of heavy metals (mainly Cu, Cd, Ni, Pb) in water and soil (Cao et al. 2009; Uchimiya et al. 2010). However, the mechanisms of immobilization of diverse concerned heavy metals on biochars produced from different pyrolysis temperatures and feedstocks were not systemically investigated. Soil properties were key factors influencing the immobilization and bioavailability of heavy metals in a contaminated soil. Therefore, it is necessary to find out the regularity between soil properties and heavy metal immobilization on various biochars. The articles published during 2011–2015 schematically elaborated the immobilization mechanisms of several common heavy metals (Cu, Zn, Cd, Ni, Pb, Hg) on biochars. The immobilization mechanisms included: (i) electrostatic attraction between cationic heavy metals and negatively charged minerals on biochars; (ii) cation exchange between metal ions and mineral ions (e.g., K+, Na+, Ca2+, and Mg2+) on biochars; (iii) complexation of metals with surface functional groups of biochars (Lu et al. 2012b; Tong et al. 2011; Wang et al. 2015c); and (iv) precipitation of heavy metals with biochar minerals (e.g., SiO32−, PO43−, OH−, CO32−) (Hu et al. 2015; Inyang et al. 2012; Meng et al. 2014; Wang et al. 2015c). Although sorption efficiency and mechanisms of heavy metals on various biochars had been widely examined, the intrinsic relationship between biochar properties and sorption was not fully understood due to the diversity of biochar. For instance, it was found that electrostatic adsorption and complexation with O-containing functional groups played a dominant role in the sorption of Cu by biochars produced from three crops, i.e., peanut, soybean, canola, at 400 °C (Tong et al. 2011). Lu et al. (2012b) found that the complexation with O-containing functional groups and coprecipitation with minerals contributed to the removal of Pb by sludge-derived biochar (550 °C). Zhang et al. (2015) showed that ion-exchange followed by surface complexation played a dominant role in Cd immobilization of water hyacinth biochar at 450 °C. Conversely, ion-exchange was found to be the predominant mechanism for the sorption of Cd and Pb by biochars (600 °C) from five waste agromaterials. Results from the study of Wang et al. (2015c) showed that precipitation, complexation and electrostatic interaction collectively contributed to Pb sorption on biochars. Among these mechanisms, precipitation between Pb2+ and the minerals could be identified as the leading mechanism for Pb2+ sorption on biochars (Wang et al. 2015c). Despite dramatic differences in immobilization mechanisms of heavy metals on biochars, some useful information could be summarized from the articles published during 2011–2015: (i) ion-exchange and surface complexation were important sorption mechanisms of heavy metals on biochars at low temperatures. However, with increasing HTT, the contribution of ion-exchange could be ignored due to other controlling factors including electrostatic attraction and precipitation; (ii) the mineral component on biochars was a dominating factor in removal of heavy metals through precipitation with anions of biochar minerals, especially for mineral-rich biochars acquired from manure and sludge. It was worth noticing that researchers began to use the method of extended X-ray absorption fine structure spectroscopy (EXAFS) to probe the local bonding environment of heavy metals after sorption on biochars (Betts et al. 2013). Beside the extensive investigation on the immobilization of metal cations, research on metal anions (As, Cr) removal by biochar had been largely conducted. Evita Agrafioti et al. (2014a) reported that biochar derived from sewage sludge was efficient in removing As(V), which was attributed to the high Fe2O3 content in ash (Agrafioti et al. 2014a). Iron oxide particles were found to cause high sorption of As via As inner sphere complexes or precipitation on the iron oxide surfaces (Aredes et al. 2013). Based on the above research, research group from Gao Bin synthesized the iron or iron oxide-impregnated biochars for the removal of As. Their results showed that iron or iron oxide-impregnated biochars significantly enhanced the sorption of As(V) (Hu et al. 2015; Wang et al. 2015b; Zhang et al. 2013a). Similar results were also observed by synthesizing manganese/aluminum/calcium oxide-modified biochars for the sorption of As(V) (Agrafioti et al. 2014b; Wang et al. 2015a; Zhang and Gao 2013). The 2 M KOH-activated biochar was also reported to be favorable for As(V) sorption (Jin et al. 2014). The increase in surface area and changes of porous texture, especially the surface O-containing functional groups on activated biochars were the major contributors for its more efficient removal of As(V) (Jin et al. 2014). The dominant mechanism for Cr(VI) sorption on biochar had been suggested for the sorption of Cr(VI) on black carbon (BC), and the sorbed Cr(VI) can be subsequently reduced to Cr(III) by O-containing functional groups on BC surface. Cr(III) can then be adsorbed again by surface complexation and precipitation on BC, which had been reported before 2010 (Hsu et al. 2009a, 2009b; Wang et al. 2010). Based on the previous studies, research demonstrated the Cr(VI) sorption mechanisms on numerous types of biochars with similar conclusions (Dong et al. 2011; Mohan et al. 2011; Zhang et al. 2013c). Agrafioti et al. (2014a) showed that the sorption mechanism of Cr(VI) was the electrostatic interactions between Cr(VI) anion and the positively charged functional groups on the surface of biochar, the reduction of Cr(VI) to Cr(III) was not observed in the study. The discrepancy might be accredited to the low content of surface O-containing functional groups on biochars, which were responsible for Cr(VI) reduction. Furthermore, the bentonite/α-Fe2O3 nanoparticle-coated biochar was also reported to remarkably improve the removal of Cr(VI) in a wide range of pH (Ruan et al. 2015). The synthetic method solved the problem of low sorption capacity of Cr(VI) on biochar at low pH. The combination of reductants (Na2SO3/FeSO4) and biochar could efficiently remove Cr(VI) from aqueous solutions owing to its considerable high reduction ability (Pan et al. 2014). These studies provided new insights for efficient removal of Cr(VI) by biochar. As shown in Fig. 5, the network presented was more complex with a larger quantity of research nodes and interlaced lines compared with the period of 2011–2015. There were 4219 documents published about biochar during the period of 2016–2018, which was much greater than that of 2011–2015. The top 20 keywords related to biochar during the period of 2016–2018 were almost similar to the period of 2011–2015, showing that the research hotspots remained unchanged. According to the visual analysis and the statistical analysis, biochar research in 2016–2018 can be primarily divided into the following six fields: biochar production, biochar and global climate change, soil quality and plant growth, organic pollutants removal, heavy metals immobilization, biochar and composting. It was worth noticing that the field “biochar and composting” was a popular topic and attained increasing attention. The node “bio-oil”, having a purple big ring around its outer edge, indicated the high centrality and interest of the research content (Fig. 5). There are a large number of documents about converting waste biomass materials into bio-oil by thermal treatments, as it is a sustainable and earth-friendly approach for bioenergy production (Cai et al. 2018a; Cai and Liu 2016; Cai et al. 2018b; Dai et al. 2017; Irfan et al. 2016; Lobos et al. 2016; Ly et al. 2016; Neumann et al. 2016; Tarves et al. 2016; Zhou et al. 2017a). Additionally, updated reactors or technologies were adopted to quickly and efficiently produce bio-oil (Cai et al. 2018a; Cai and Liu 2016; Cai et al. 2018b; Tan et al. 2017). The characterization of bio-oil had also been widely conducted (Anupam et al. 2016; Gao et al. 2017; Mandal et al. 2018; Morali et al. 2016; Tan et al. 2017; Wu et al. 2017a). Ghidotti et al. (2017) used a novel technology of ultrahigh resolution mass spectrometry Fourier transform ion cyclotron resonance mass spectrometry (FT–ICR–MS) to detect the chemical composition of bio-oil, which highlighted the understanding of bio-oil produced during thermal treatments. The research about the potential risk of biochar remained to be a hotspot. The research on biochar risk was shifted from plant and soil fauna to enzymatic activity and microbial population (Mierzwa-Hersztek et al. 2016, 2017; Oleszczuk and Koltowski 2018; Raclavska et al. 2018). Enzymatic activity and microbial population were considered as sensitive and effective bio-indicators, and important for the assessment of the potential risk of biochar amendment into soil (Mierzwa-Hersztek et al. 2017). Despite of various benefits of biochar application on agriculture and environment, it is crucial to assess their potential risk to the ecosystem and humans. In recent years, more and more research activities had been dedicated to enhancing biochar stability. The methods included: (i) co-pyrolyzing biomass with beneficial minerals to produce mineral-rich biochar (Rafiq et al. 2017; Rawal et al. 2016; Ren et al. 2018; Xiao et al. 2018b; Yang et al. 2018b); and (ii) impregnation of biochar with minerals (Yang et al. 2016a, 2018a). The designed biochars would probably improve biochar stability and carbon sequestration capacity, and mitigate global climate change. Increasing number of studies were conducted in recent years to explore the microbial mechanisms of biochar-induced changes in N2O/CH4 emissions from soil (Hagemann et al. 2017; Han et al. 2016a; Harter et al. 2016; Sun et al. 2018; Wang et al. 2017c). The development of distinct N2O-reducing microbial taxa induced by biochar might lower N2O emission (Harter et al. 2016). Wang et al. (2017c) reported that biochar amendment decreased N2O emission and increased CH4 emissions by reducing the abundance of denitrifying bacteria and by increasing the abundance of iron-reducing bacteria, respectively. However, results from Han et al. (2016a) indicated that biochar amendment reduced CH4 emission in a paddy soil, which was primarily attributed to the reduced activity of methanogens along with the increased CH4 oxidation activity. The contradiction might be attributed to the difference of soil and biochar properties. Therefore, the effects of biochar on soil microbial community along with greenhouse gases emissions in different types of soils should be further explored. The metallic (oxyhydr)oxide nanoparticle-supported biochars were applied as inexpensive large-scale CO2 capture materials, which provided a new and promising candidate for real-world CO2 capture systems (Creamer et al. 2016, 2018; Lahijani et al. 2018). The research about biochar amendment for improving the quality of a sandy loam soil received great interest (Amoakwah et al. 2017a; Cheng et al. 2017; Igalavithana et al. 2017; Sun et al. 2017). The biochar amendment could effectively improve water retention capacity in a sandy loam soil (Aller et al. 2017; Amoakwah et al. 2017b; Hansen et al. 2016; Igalavithana et al. 2017) consequently decreasing the N fertilizer leaching (Sanger et al. 2017; Sun et al. 2017). The studies investigating the beneficial effects of biochar on soil properties and plant growth were conducted on a long-term basis (Griffin et al. 2017; Haider et al. 2017; Hardy et al. 2017; He et al. 2018b; Laird et al. 2017; Luo et al. 2017; Madari et al. 2017; Qin et al. 2016; Sanger et al. 2017; Wang et al. 2018). The long-term field experiments could provide significant data for the assessment of agronomic benefits of biochar application. The articles about organic contaminant removal by biochar were sustainably growing. Apart from the discussed sorption mechanisms of organic contaminants by biochar published during 2011–2015, Lewis acid–base interactions also contributed to the organic sorption by biochar (Lian et al. 2016). Additionally, the modified biochar was widely used and exhibited better sorption capacity of organic pollutants than pristine biochar (Abdul et al. 2017; Li et al. 2017b; Reguyal et al. 2017; Shan et al. 2016). Biochars after post-pyrolysis thermal air oxidation could also greatly enhance the sorption of organic compounds (Xiao et al. 2018a; Xiao and Pignatello 2016). More importantly, the degradation of organic pollutants by biochar deserved increasing attention because it could completely remove organic pollutants. The persistent free radicals could directly degrade (Chen et al. 2017a; Fang et al. 2017; Qin et al. 2017a; Yang et al. 2016b, 2017) or activate H2O2/persulfate (Ouyang et al. 2017; Wang et al. 2017b; Yang et al. 2017) to degrade organic pollutants. Modified biochar was also effective in the degradation of organic pollutants. The most commonly used method of modification was Fe (hydr)oxide/nanoscale zero-valent iron-supported biochar. Then the modified biochar activated H2O2 to degrade organic pollutants under various Fenton-like oxidation conditions (Deng et al. 2018a; Park et al. 2018; Qin et al. 2017b; Yan et al. 2017; Zhang et al. 2018). The literature regarding heavy metals immobilization by biochar with traditional sorption methods was based on previous studies and decreased during 2016–2018 (Kolodynska et al. 2017; Lu et al. 2017; Park et al. 2016b). The research hotspots were transformed to competitive sorption between heavy metals (Deng et al. 2017; Park et al. 2016a), organic and heavy metals co-contamination removal (Frankel et al. 2016; Zhou et al. 2017b). An increasing research interest focused on the activated or modified biochar, which exhibited extremely high sorption efficiency for heavy metals (Deng et al. 2018b; Ding et al. 2016; Li et al. 2017a; Ling et al. 2017; Liu et al. 2016; Niu et al. 2017; Trakal et al. 2016; Wu et al. 2017b). Among the heavy metals, Cd immobilization by biochar was most studied, which could be seen from the relatively big ring in Fig. 5. That is because Cd pollution was the most serious threat in China according to the national general survey of soil contamination (2013). Moreover, most of the literature was published in the journal of “Bioresource Technology” (Chen et al. 2018; Ifthikar et al. 2018; Jung et al. 2018; Shi et al. 2018; Son et al. 2018; Trakal et al. 2016; Yoon et al. 2017; Zuo et al. 2016). The modification methods were more diverse than those in 2011–2015. For metal anions (As, Cr), a growing number of documents also paid attention to modified biochars, which exhibited high removal capacities of As and Cr. The most commonly used modification methods were Fe/Mn oxides and nanoscale zero-valent iron supported biochars for As removal. The mechanisms for higher As removal capacities by modified biochar included more adsorption sites for arsenic(V) removal, ligand exchange between As(V) anion, the hydroxylated surface, and H bond (Wang et al. 2016, 2017d; Yoon et al. 2017; Zhang et al. 2016a; Zhou et al. 2017c). Similarly, the most popular modification methods were Fe/Mn oxides and nanoscale zero-valent iron-supported biochars for Cr(VI) removal (Dong et al. 2017; Duan et al. 2017; Qian et al. 2017; Su et al. 2016; Wang et al. 2017a). Greater electrostatic attraction and reduction capacity might be attributed to the higher removal of Cr(VI) by modified biochar (Han et al. 2016b; Qian et al. 2017; Su et al. 2016). It was worth noticing that the field “biochar and composting” was a popular topic and attained increasing attention (Fig. 5). Composting was a widely used and effective method for converting organic wastes into relatively stable humus-like product that could be used as soil amendment or organic fertilizer (Doublet et al. 2011). However, some drawbacks (e.g., N loss, GHG emissions, toxicity) were associated with composting and the compost quality should be improved (Awasthi et al. 2016b). The use of biochar in organic waste composting had attracted special interest in the last decade because it improved the compost value and enhanced the environmental and agronomical benefits. During 2016–2018, numerous studies have systemically evaluated the advantages of biochar on organic waste composting including accelerating organic matter degradation and humification (Jindo et al. 2016; Zhang et al. 2016b), enhancing microbial diversity (Liu et al. 2017a; Sun et al. 2016), reducing N losses (Agyarko-Mintah et al. 2017b; Lopez-Cano et al. 2016; Wang et al. 2017e), reducing greenhouse gas emissions (Agyarko-Mintah et al. 2017a; Awasthi et al. 2016a; Chen et al. 2017b), and reducing the bioavailability of heavy metals (Awasthi et al. 2016a; Liu et al. 2017b) and organic pollutants (Stefaniuk and Oleszczuk 2016). The most commonly used organic waste for composting was manure (see Fig. 5). Consequently, biochar was an ideal biological substrate to reduce the length of the composting process and enhance the value of compost. This study offers a comprehensive scientometrics review on the development trends of biochar research during 1998–2018. A systematically structural description of the research status, as well as some significant conclusions as to the nature of biochar domain are obtained. 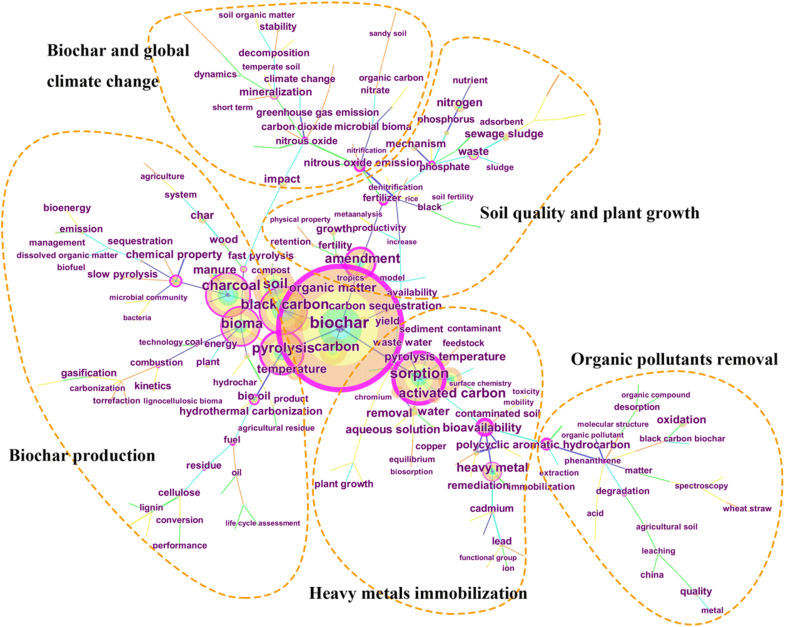 First, the analysis of keywords clustering indicated that the main research hotspots during 2011–2015 were “biochar production”, “biochar and global climate change”, “soil quality and plant growth”, “organic pollutants removal”, and “heavy metals immobilization”. The research about biochar was considerably diversified and developed compared with documents published before 2010. The effects of feedstocks and heat treatment conditions on soil and farming, global climate change, bioenergy production, and remediation were well elucidated. This would be beneficial for the synthesis of biochar-based functional materials for specific purposes. In addition, the agronomical and environmental benefits and ecotoxicity of biochar application were largely addressed. Second, besides the five main research hotspots, the topic “biochar and composting” received increasing attention in 2016–2018, indicating that biochar utilization in organic solid waste composting is the current research hotspot. Updated reactors or technologies were applied for efficient energy production. Additionally, the modified biochar was widely produced and applied in environmental remediation. It should be also addressed that several limitations remain to be overcome in the future research. Research on modified biochar has been extensively applied in remediation, yet it is still in its preliminary stage. The potential risk and expenses of modified biochar production and application are less considered and more research is needed in the future. Manure for composting usually contains toxic substances; nevertheless, the long-term risk assessments are necessary before its wide-spread application combining with biochar. More attention is required to assess the risk of persistent free radicals in biochar in the future because it is difficult to directly test at present. We gratefully acknowledge the support by the National Natural Science Foundation of China (21537002, 41422105, 41671478), and the Natural Science Foundation of Jiangsu Province, China (Project No. BK20130050).